NOW WITH MORE! 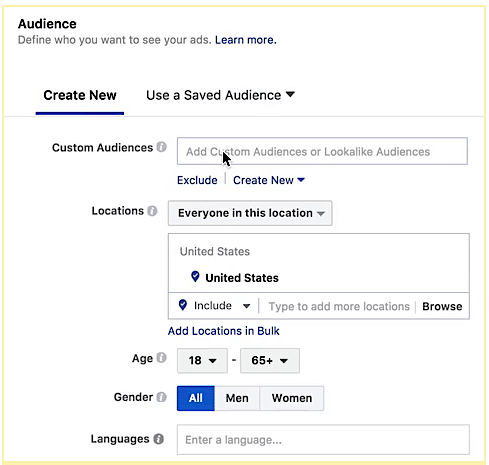 This post has been updated for 2019 with much more info to help you easily create your Facebook Retargeting Campaign! Studies show that 72% of online shoppers will abandon their cart before making a purchase. 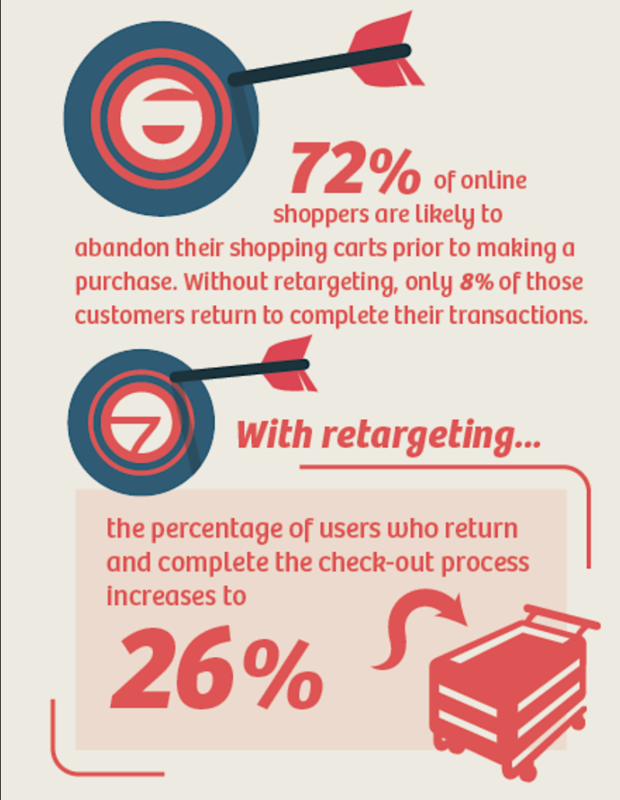 However, 26% of them will return to complete their purchase later – if they are retargeted. That means that setting up good retargeting campaigns can recover nearly 1 in 4 of every lost sale due to cart abandonment. For most sellers, that’s a huge revenue boost they would gladly welcome. Customers are humans and humans are complex-indecisive creatures. Especially in the age of the Internet, our brains are constantly jumping from one thing to another. Free Bonus Download: Use this handy Facebook Lead Ads Quick Start Guide to get you up and running in no time! Click here to download it for free right now! The list goes on and on. But the good thing is that many of those problems can be overcome with a little nudge or by offering an extra bit of value. Customer got distracted during checkout? 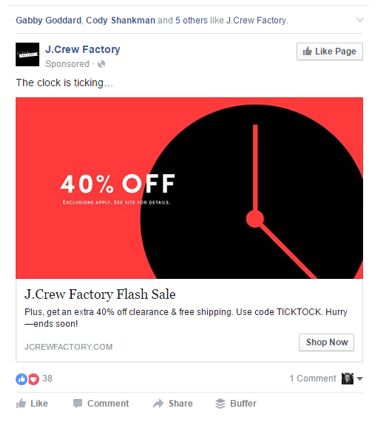 Maybe if they see your product in their News Feed, they’ll remember and finish the purchase. Customer not sure if it’s worth the value? Maybe a targeted 20% offer is what it takes to make the first sale and start building your customer relationship. The best part is that you only have to offer it to customers on the fence. Everyone else pays full price! 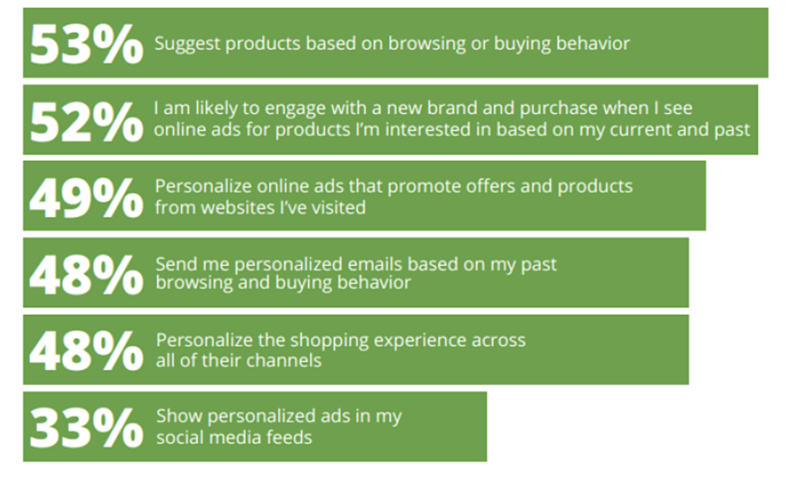 Retargeting lets you do all of this. The biggest retailers have been doing it for over a decade. 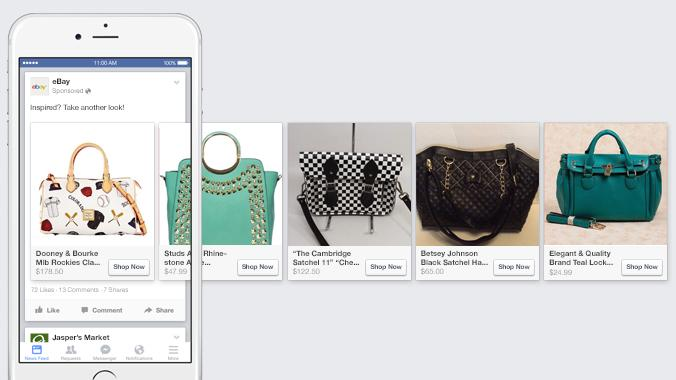 But now with Facebook’s robust toolkit, every e-commerce seller has the ability to make specific, personalized retargeting ads. 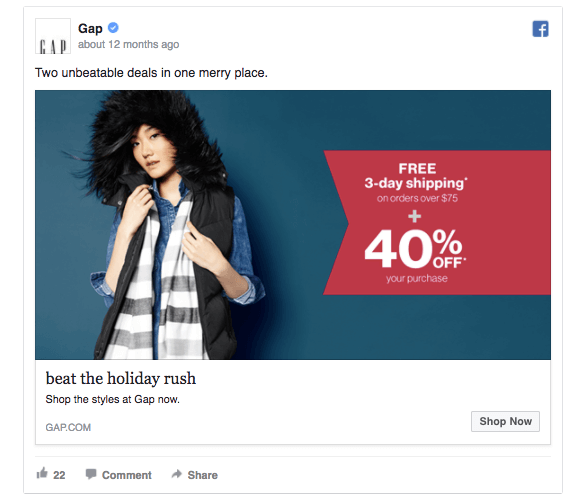 Some retailers worry that retargeting might feel invasive, but the truth is, it’s becoming the norm. Most consumers expect to be tracked online and understand that information is being used to market to them. In fact, a growing majority of customers report that they appreciate when brands retarget them with offers specific to their interest. A good retargeting campaign shows that you’re paying attention and that you care about the customer’s buying experience. This article will show you how to set up an effective, high-converting Facebook retargeting campaign. The first step is to make sure you properly install your Facebook Pixel. 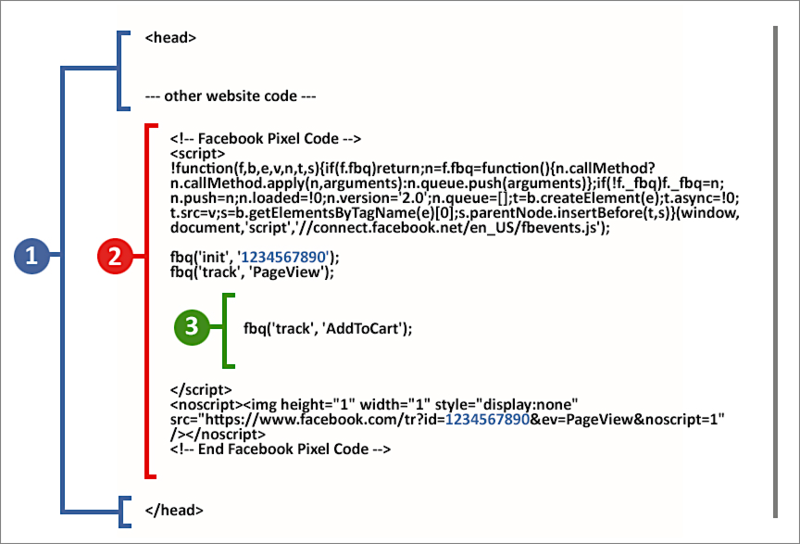 In early 2017, Facebook replaced their old tracking and conversion pixels, so even if you’ve done this in the past, make sure you have the updated code. Without this pixel, you won’t be able to track who’s visiting your site and how they’re behaving. So, it will be impossible to retarget them. Then you’ll need to decide how you’re going to install the pixel on your site. 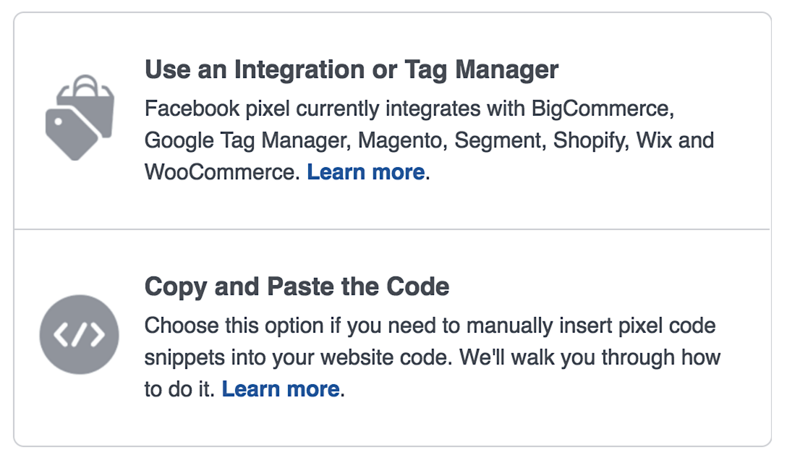 Facebook currently integrates with BigCommerce, Google Tag Manager, Magento, Segment, Shopify, Wix, and WooCommerce. If you’re using any of these, simply select your platform and follow Facebook’s step-by-step instructions. If not, Facebook still makes installing the pixel easy on any site. All you need to do is copy and paste the code between the tags on your site. Most platforms should provide simple instructions for how to edit this section. 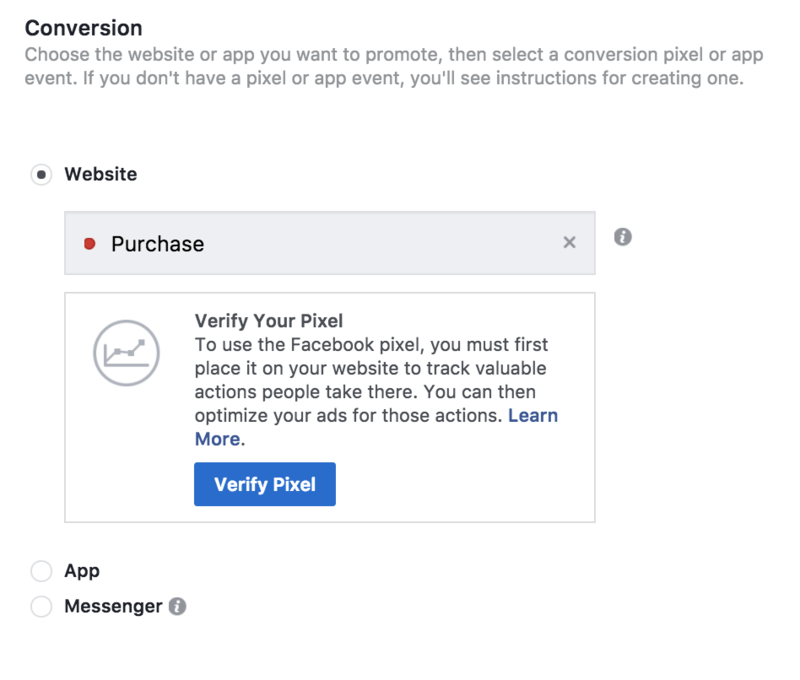 If you want to take this one step further, you can use the Facebook pixel to track specific actions that customers take on your site, like Add to Cart, Purchase Complete, etc. The only difference here is that you’ll need to add a few extra lines of code (shown in the green #3 section above) on specific pages. Facebook has recently made this pretty easy, too. Select the action you wish to track and modify the blue parts of the code to match your values. Then copy and paste the code and follow the instructions below to know how it should be placed. The most common pages for conversion tracking are the Checkout and Thank You pages. Note: If you don’t have specific values to enter, or don’t care to track them, you can switch to “Basic” at the top of the widget and just track the action itself. This allows you to collect more data on how your campaigns are affecting your bottom line and how customers are behaving on your site. 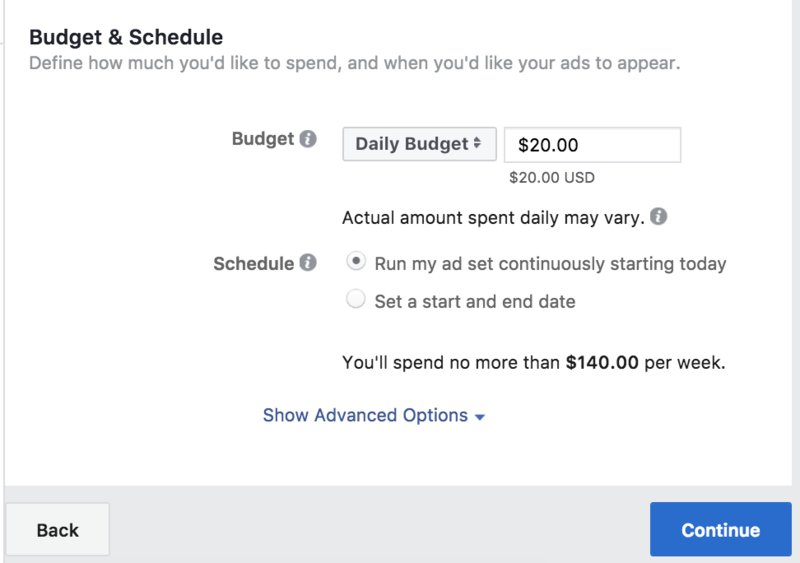 It can also help Facebook optimize your ad campaigns to maximize your ROI based on your specific goals. Pro Tip: Download the Facebook PixelHelper plug-in for Chrome to check your site and make sure everything is installed correctly. If you still need help, check out Facebook’s guide on Facebook Pixels. 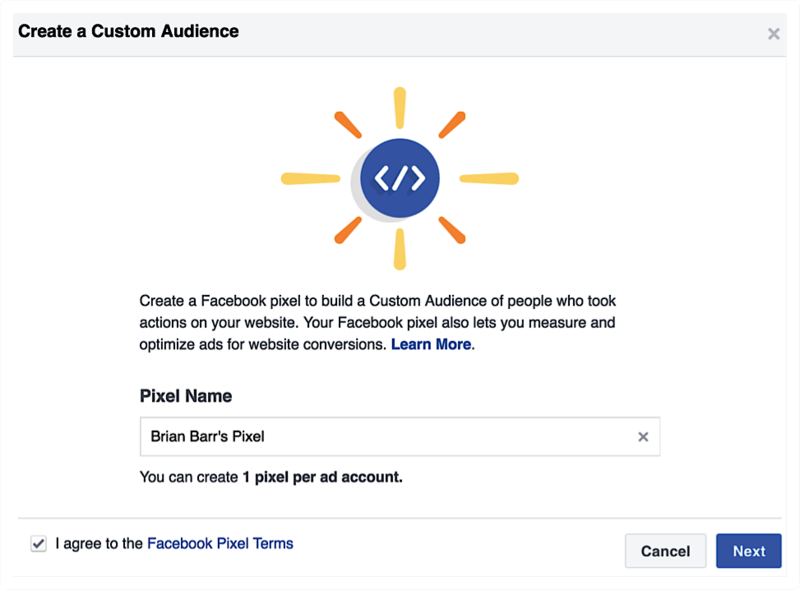 Once you have your pixel set up, head over to Facebook’s Ad Manager and create a custom audience to retarget. Go to Menu > Audience. Then select Create Audience > Custom Audience…. Who you’re targeting will depend on your campaign goals. For this guide, we’re going to focus on creating a campaign to capture abandoned carts. To do this, we’ll target anyone who’s looked at both our ceramic mug products AND the checkout page. This tells us that they viewed our products and then went to check out. Make sure the URL parameters you include here actually cover all the products you’re looking to target. This is another key reason that your URL should always contain the product title. Now that gives us everyone who started the checkout process with our ceramic mugs. However, we don’t want to show these ads to customers who’ve already completed their purchase. That might drive costs up and worse, annoy or confuse customers. To avoid this, just click “Exclude” on the bottom right and filter the audience to ignore anyone who has visited your Thank You page. This should be the URL of whatever page you direct customers to after they complete a checkout. The other parameter you can control here is time. It really depends on your goal. If you’re simply retargeting people who viewed your content or blog posts, the default 30 days might be good. However, cart abandonment ads might be better served by 10-14 days. If the customer still doesn’t want to purchase your product after two weeks, you’re probably only annoying them and wasting money. Now that you’ve set up your filters, all you need to do is name the group and save. 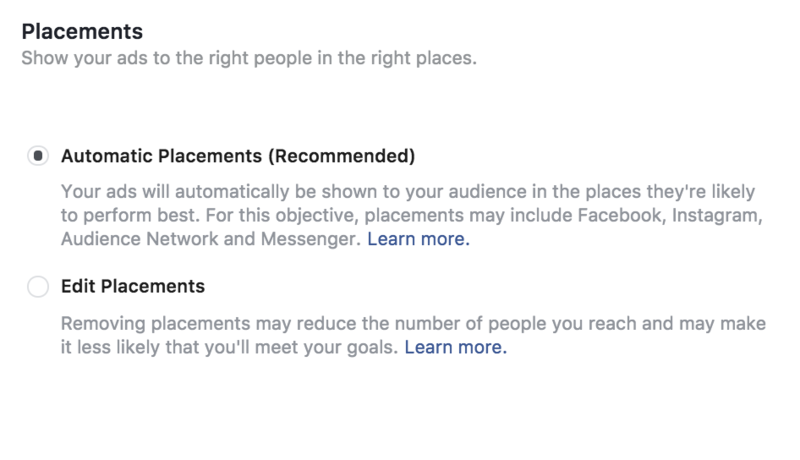 Facebook requires at least 20 users to fit your criteria before it can run. Continue setting up your ad and it should turn on as soon as customers start being tracked on your site. Once you’ve set up your audience, you need to hit them with some targeted ads. It’s usually most effective to create specific ads based on specific products or categories. If you have a large catalog of products, you can set up specific retargeting campaigns for best sellers and more general ones for each category. 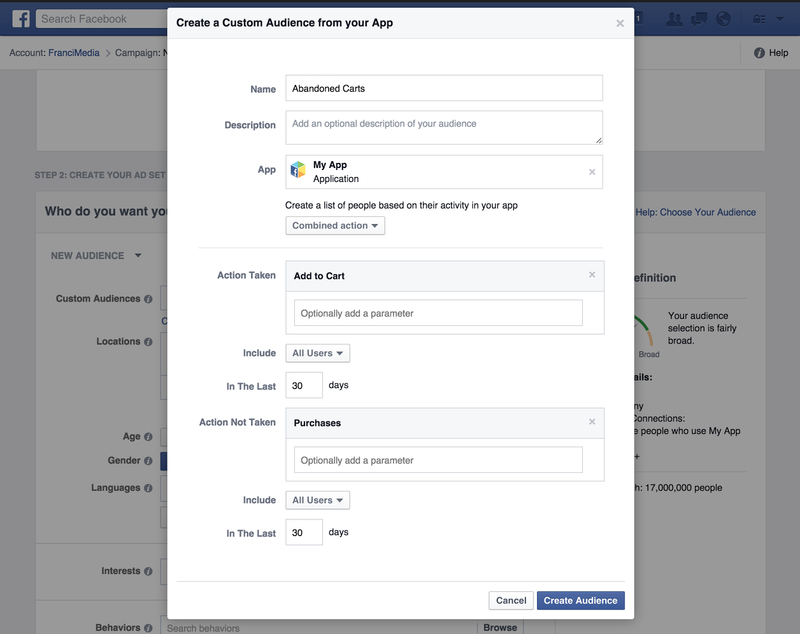 Or check out Facebook Dynamic Ads, which can create automatic ads for all your products. We’ll talk about these more later. 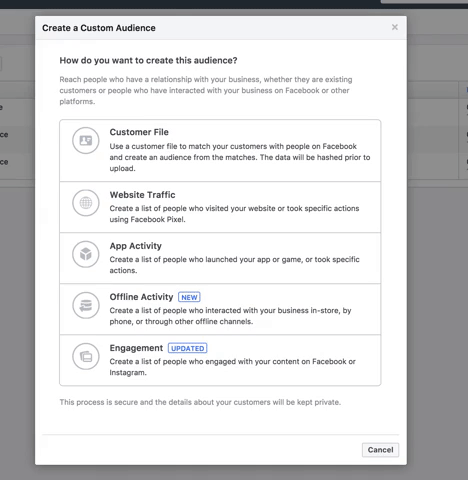 For now, let’s focus on how to create a single Facebook Retargeting campaign. That being said, you should still include your brand and logo in the photo if possible, because you’ll be getting tons of impressions from this campaign even if the buyer decides they aren’t going to buy that specific product. When you’re ready, hit “Create Ad” in the top right corner of any dashboard view. Both goals have their place and purpose, so it’s really up to you. If you sell a high-priced product and notice that customers often need to visit your site multiple times before buying, or if you’re targeting customers based on category and blog views, it’s probably best to stick with traffic goals. Also, keep in mind that to target conversions, you’ll need to put in a bit more work setting up your site to track specific events and goals like we talked about briefly in step one. Conversions are a little bit more complicated, so I’ve chosen to use it here as the example. If you can follow this, setting up a Traffic Campaign will be no problem for you. 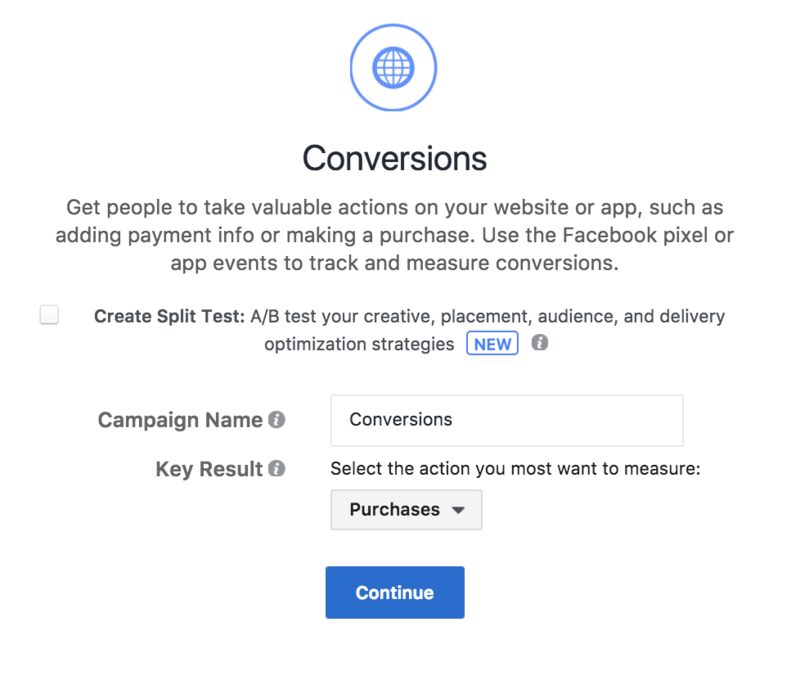 To start, name your campaign and hit “Continue.” Then you’ll need to select your conversion goal and verify your pixel. For this kind of ad, the most logical type of conversion is a purchase. If you need help with this, just click “Learn More” and Facebook has some guides on setting up goals and funnels. 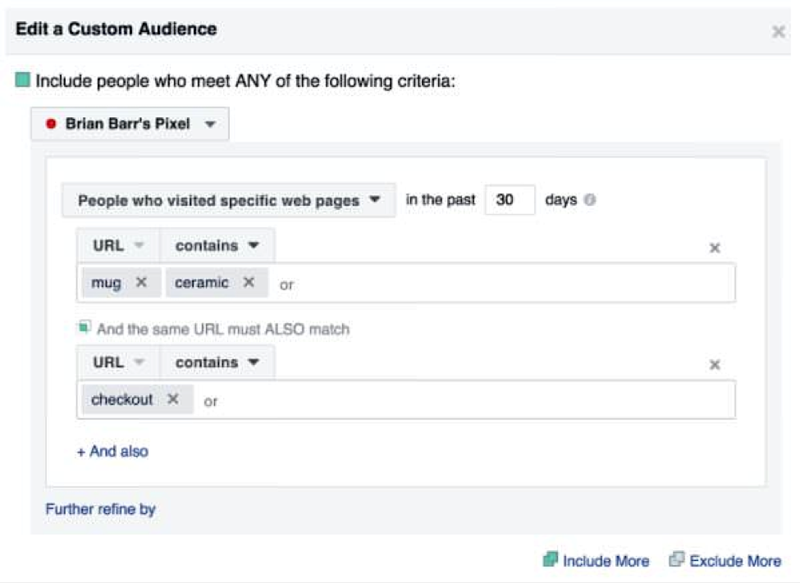 Under “Custom Audiences,” select the retargeting group you made in step 2. Unless you have a good reason, you shouldn’t narrow the audience anymore. 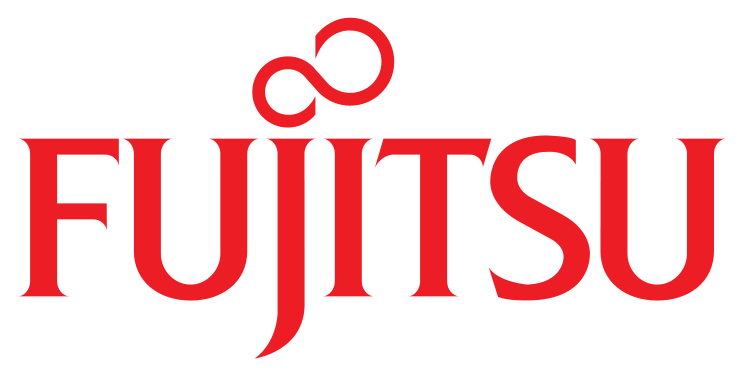 It’s already targeted based on customers who have shown interest. For this reason, I usually ignore everything else in this section, including the “Detailed Targeting” section (which can be very useful for standard, non-retargeting ads). The exception to this is if you’ve been receiving a lot of unqualified traffic. For example, let’s say you run a content campaign for 21+ music event using a popular band. You might draw in a lot of teenagers or visitors out of the region. You could add filters based on location and age to avoid wasting your budget by advertising to people who cannot attend, even though they may be interested. Be careful here though. Your customers might not always be who you think. It might be tempting to exclude men over 40 from your doll store’s retargeting ads. But many of them may be dads looking to buy toys for their children. One interesting feature that Facebook recently added was the “Connections” feature. 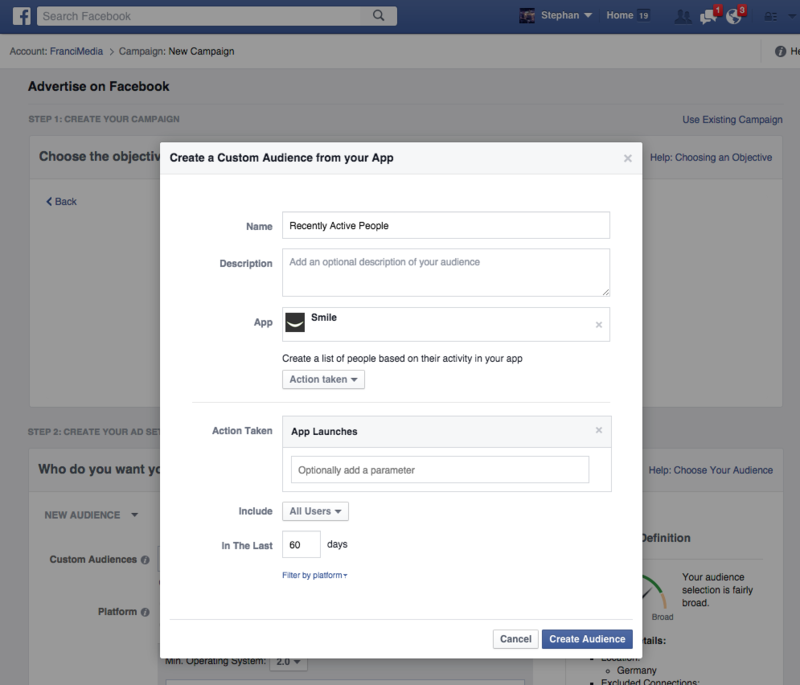 This allows you to pull in tracking data from your Facebook pages, apps, and events. You can target people who responded to your event invite, who like your Facebook page, or have used your Facebook app. You can even choose to exclude those people or target their friends. If you don’t know your App ID, check out this guide. There are tons of special cases when each of these could be useful, but for retargeting, your best tools are to include people who used your app or liked your page. 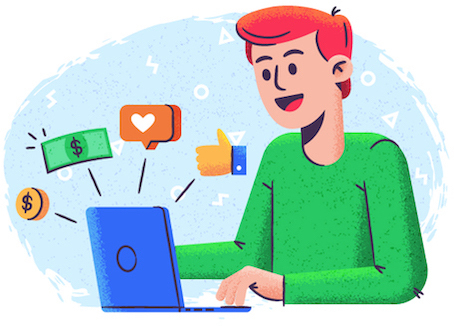 You can use this to create a campaign for very engaged people that are interacting with your website and Facebook presence. Or you could even rely on this feature to target potential engaged customers (just leave the custom audience section blank). But as you’ll see toward the end of this article, it would be much more effective to create a custom audience based on engagement metrics and use that. After you’ve designed and targeted your ad, you need to determine where it will show. Honestly, the best option here is automatic placements. So I’m not going to spend too much time on it. If your situation calls for it, you can also target the ads based on specific devices, platforms, and locations. But for most situations, Facebook knows better than you. Let them put the ads where they will best convert. The budget will vary heavily from business to business, but remember that you can always start small and then raise the budgets on your most profitable campaigns. You don’t need to spend a lot of money to see results with your Facebook ads. You should run your ads continuously for a retargeting campaign. You’ll have new customers finding your site and abandoning their cart every day. While you should check in and make sure your campaigns are effective, there’s no reason to stop one that’s working. From here on, everything is the same as creating any great Facebook ad. Make sure to spend time crafting compelling ads with bold images and action-inducing triggers. I used an abandon checkout example above because it shows off some advanced features and represents a pretty standard use case. But, of course, you might not be selling ceramic mugs (or you might be selling thousands of different types of them). 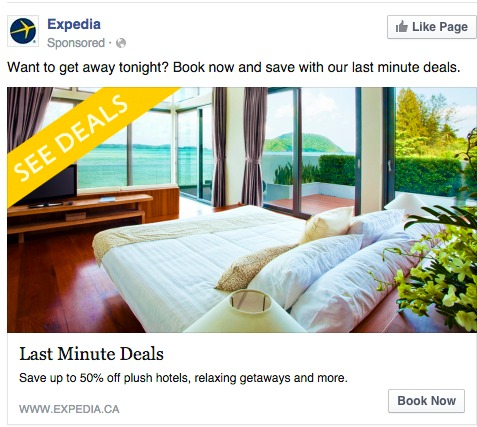 They are clearly targeting consumers who have searched for flights in the short term or clicked on special “last-minute flight” offers and flash sales in past promotions. Or possibly even customers who have visited a blog article about last-minute travel or ways to save money on travel. 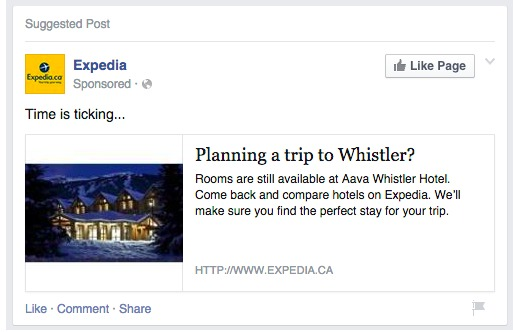 When people click on the ad above, Expedia notes that the customer is definitely interested. If the promotion is running for a limited time, they would be wise to leverage FOMO and remind the customer they will soon miss out. If you do have a large product catalog, you should consider implementing Facebook’s Dynamic Ad service. This allows your Facebook pixel to track the behavior of individual visitors and see what specific products they are looking at. It takes a bit more work to set up than basic retargeting ads. But once you finish, it’s pretty much on autopilot. Almost all of the big e-commerce brands use these ads, but they’re also completely accessible to smaller retailers. A common reason customers don’t buy is that the price seems high, especially after you add in shipping costs (PayPal found that 43% of shoppers abandoned their carts because of shipping costs). It may mean sacrificing a portion of your margin, but once you deliver great value to a customer, they will become much more valuable to your business (spending as much as 300% more and costing you less in advertising). The age of chatbots is upon us. While they still aren’t great for direct selling, there are plenty of ways that e-commerce companies can utilize them to engage with customers and drive sales. 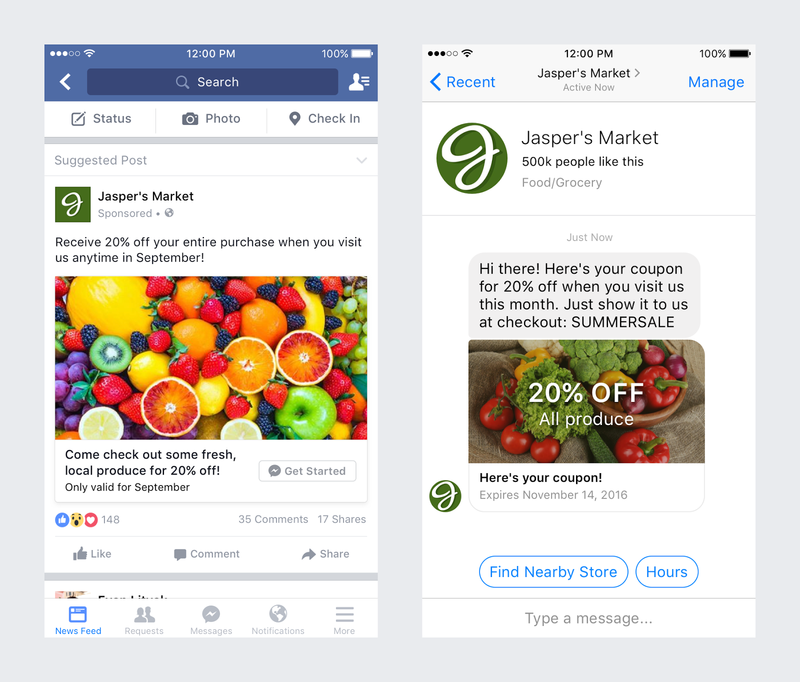 There’s been no better time to implement them than now since Facebook has added a feature to their ad platform that allows your customer to open a chat with your right away. This video from WhatsHelp shows you how to quickly set up a chatbot and link it to your Facebook ads. Website traffic is by far the most popular and automated way to build an audience for your retargeting ads. But it isn’t your only option. Here are a few other ways you can build a custom audience for retargeting. You can actually target customers just by using their email address or other contact information. You can upload a list of data that you collected either online or offline at an event to target a specific group of people. They’ll even let you import your data directly from MailChimp. This can be great if you have a specific segment you’d like to target with a promotion, such as upselling customers that have purchased a specific product. 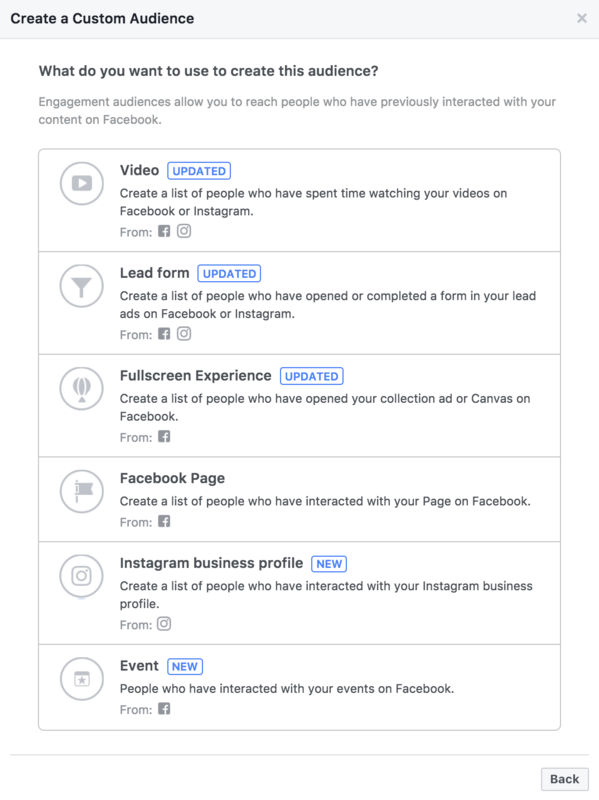 Or it can help you target people who signed up for your newsletter before you invented the Facebook Pixel and you need to re-engage to get them back on your site. For smooth processing, make sure to read Facebook’s guide on preparing and uploading your customer data. App activity tracking works just like a Facebook Pixel for your website but instead focuses on your app. By implementing Facebook’s special code into your app you’ll be able to target people specifically by this data. For example, you can run an engagement campaign for users that haven’t logged into your app in 60 days by letting them know about new features. Or you can track customers that have added an item to their cart this month, but not completed the checkout. Offline activity tracking is similar to Customer Files but requires someone at your company to periodically upload data about customer behavior in-store. You can learn more about it here. 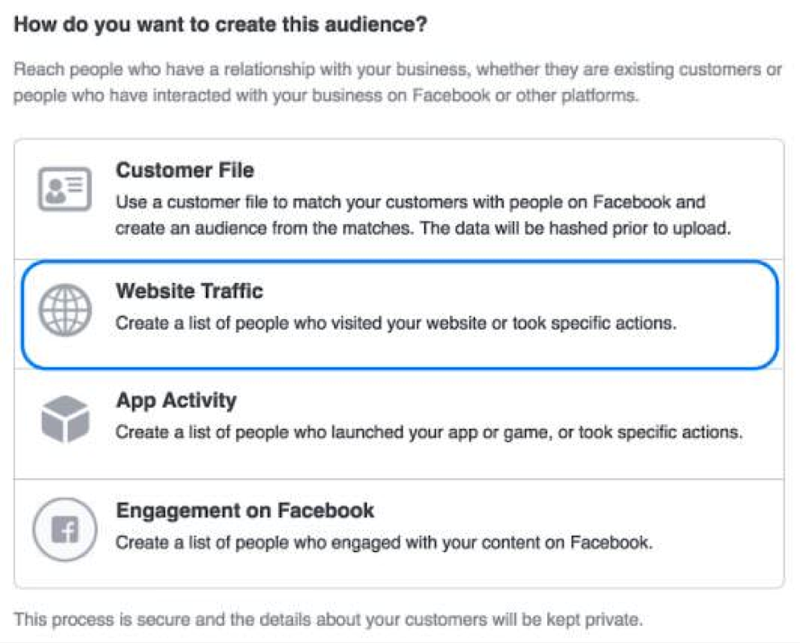 This new targeting feature allows you to target users based on their Facebook behavior. 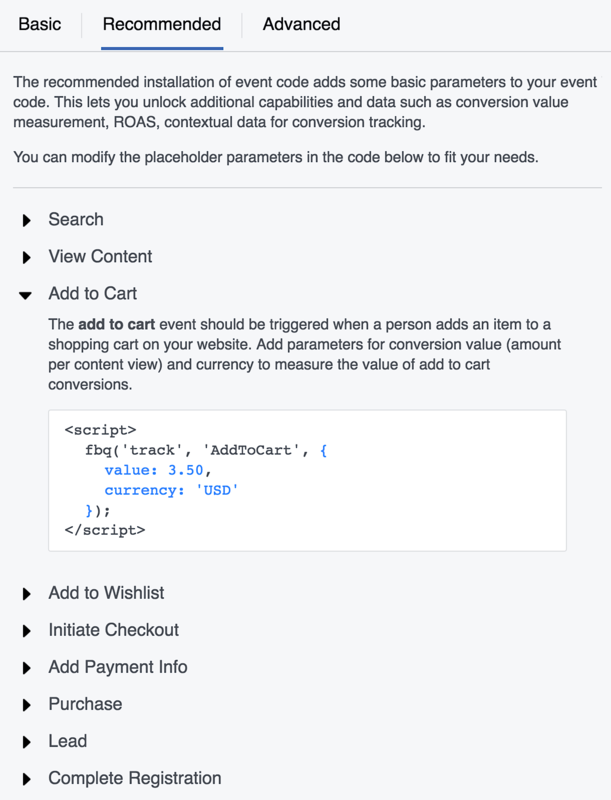 It works just like event tracking with your Facebook Pixel but on Facebook products (including Instagram). This is the “Connections” section of Facebook Ad targeting on steroids. It lets you track more behavior AND it lets you track that behavior better. 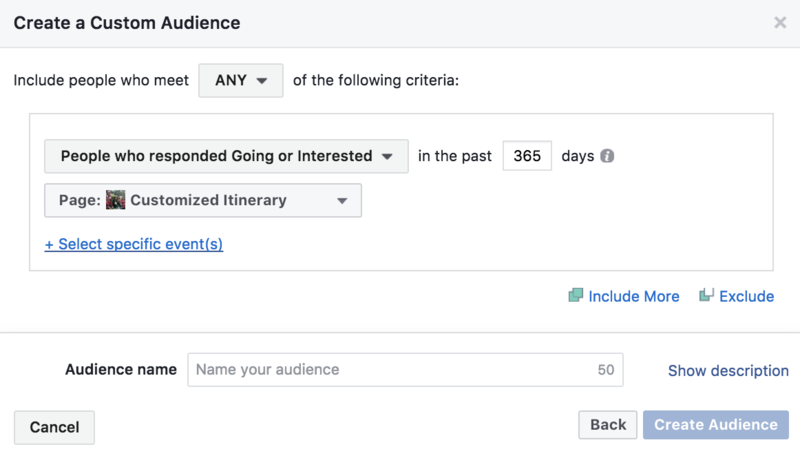 Under basic ad targeting, you can only filter by people who have responded to your event. It doesn’t matter if they clicked attended, interested, or not. Not great. Retargeting ads on Facebook is one of the fastest ways to boost sales, conversion rates, and your bottom line. Implementing a good retargeting strategy can dramatically improve your paid advertising ROI. Keep your brand at the top of mind of the customers who are still deciding and start recapturing sales from those people who genuinely just forgot. 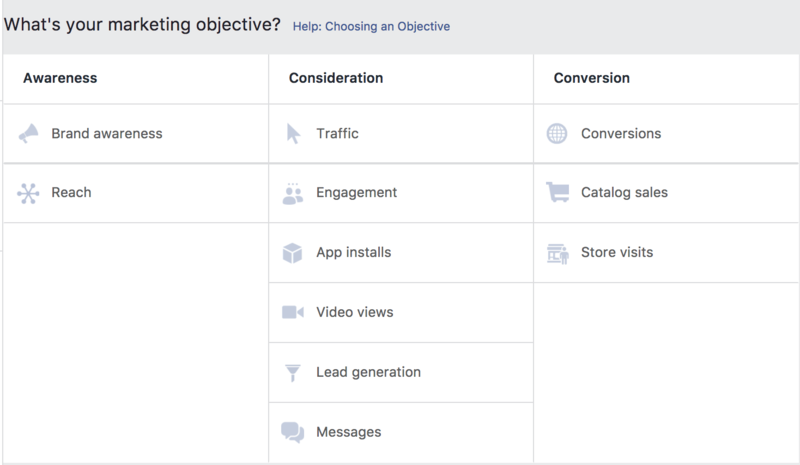 Now with this guide, you have no excuse for not running Facebook retargeting ads! Brian Barr is a strategic content writer and marketer who helps e-commerce retailers and B2B companies grow traffic, leads and sales.